Mona Ameli is the former Global President of Medifast-Optavia and an accomplished C-Suite and cross-functional executive with 23 years of progressive experience building multinational Consumer Packaged Goods and Lifestyle brands, reaching every major region in the world with deep operating expertise turning around large businesses, in both public and private environments. She successfully led a recent business turn around through a cultural leadership transformation that delivered exponential growth in revenue & operating income for Optavia. 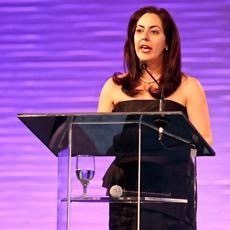 Recognized twice as one of the Most Influential women in the Direct Selling industry (DSN) and one of the most Powerful & Influential Women in California (National Diversity Council), Ameli is multi-cultural, multi-lingual (fluent in 4 languages) and was Chair of the Diversity & Empowerment Council of the Direct Selling Association Board of Directors for 3 consecutive terms. Mona Ameli is currently the managing partner of Carpe Diem Partners, a boutique consultancy focused on Talent Management and Acquisition for Boards Members, Chief Executives and Senior-Level Executives; Advising Public, Private and Investor-backed companies on leadership imperatives.